Eliminate bunching and layering with The Invincible Wader Sock. Newly developed and field tested by Orvis fly-fishing and hunting staff, the new Invincible Wader Sock is ready to take you from hearth to field in total comfort. Merino wool, nylon, and just a hint of Spandex unite in a knitted rib construction with padded sole for comfort. 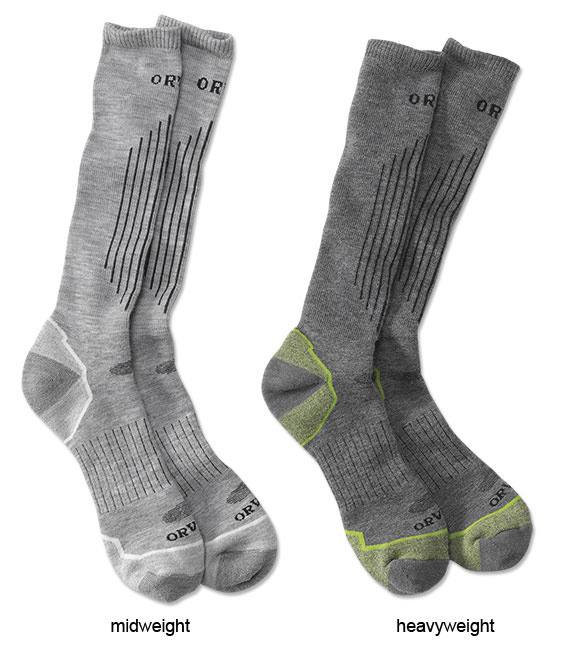 Special 1X1 ribbing constructed into the face of the sock eliminates bunching and layering, while strategically-placed nylon at the heel and toe ensures durability. Midweight is 20% lighter than its heavier brother. 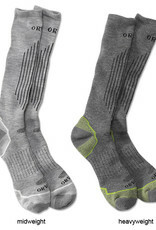 In light gray (midweight) or dark gray (heavyweight). Midweight: 62% merino wool/33% nylon/5% Lycra. Heavyweight: 77% merino wool/19% nylon/4% Lycra. One pair per pack. Washable. Made in USA.